The North East was a pioneer in the new era of electric suburban railways that began in the first years of the 20th century. When faced with stiff competition for customers from the newly constructed electric tramways between Newcastle and the coastal suburbs on the north side of the River Tyne the North Eastern Railway company had to take decisive action to win back the two million passenger journeys that had been lost to the trams in 1902 alone. The NERs response was a reinvention of their own suburban lines that ran from Newcastle Central station out via Byker, Wallsend and Benton to Tynemouth and Whitley Bay. By electrifying the lines en-masse in 1904 the NER created Britain's first all electric suburban rail network. The NER hired Charles H. Mertz as consultive engineer for the project and work began in January 1903. The system was partially opened on 25th of March 1904 with the whole system completed by August of that year. The plan to take on the tramway competion worked and all the lost passengers were won back from the trams. The commuters and leisure travellers of the area enjoyed a vastly improved service of swift, efficient, comfortable trains that were far superior to the steam hauled services they replaced. The trains were provided with electricity from an extra, or 'third' rail which was laid next to the track gauge on porcelain insulators which the trains collector shoes made contact with on the top surface of the live rail thus energising the electrical equipment on the train. The NER did not build their own power station but chose to buy in electricity from the Newcastle-upon-Tyne Electric Supply Company.A new train shed to berth and maintain the EMU stock was built at Walkergate near Heaton. 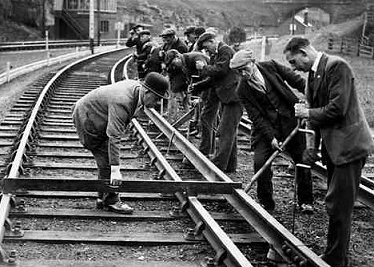 Workers relaying a section of third rail near Benton in 1936. 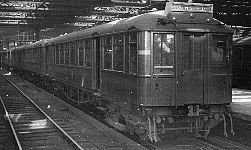 In 1937 the North Tyneside electric lines, then under the control of the London North Eastern Railway were complemented by the addition of a South Tyneside electric route when the line from Newcastle Central to South Shields via Gateshead and Pelaw was also electrified on the third rail principle, the LNER also had a new fleet of electric unit built to operate the original North Tyneside routes. No further extensions to the system were made and by the early sixties the whole of the electrical equipment was in need of renewal. British Railways took the extreme decision not to renew the electrical equipment but to replace the electric trains with diesel units. 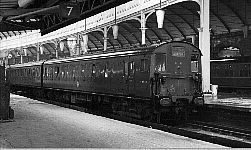 The South Tyneside line was de-electrified in 1963 and the last electric trains ran on the north side of the river four years later. It was perhaps the most fitting endorsement of the NER's original electrification policy that eventually all of the routes were re-electrified in the early 80s as they became part of the Tyne and Wear Metro network, and once again the north east has set a new standard of suburban rail transport, one that has been copied with metro networks constructed in a number of major cities across Britain. An original 1904 built North Eastern Railway unit. The layout and style of these vehicles was heavilly influenced by American EMU design. A unit built by the NER at their York works in 1920 to replace a large number of original vehicles destroyed by a fire at the Walkergate car sheds in 1915. 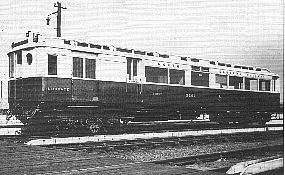 A 1937 articulated unit built for the LNER by Metro-Cammel, large numbers were built to replace all of the original 1904 stock. 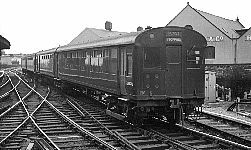 A 1954 2 car unit built by British Railways at their Eastleigh workshops, this was the last stock built for the original Tyneside network.